4. An institution as a general place of communication, generated by an extra ordinary state of the people visiting the place. These four premises disclose a particular chemistry between the two- and fourfold-way of thinking. The illness is often regarded as a disturbance of a balance of some sort. The healthy situation – meaning a type of living in which no physical and psychological hindrance is distinguished – is taken as a frame of reference. Any deviation of that course is labeled as an illness. This basic belief in a balance and its subsequent disturbance is directly derived from an oppositional cognitive setting. ‘Healing’, ‘restoring health’ and ‘curing’ are terms, which have their genetic meaning embedded in lower division thinking. Modern (quadralectic-inspired) medicine has to use these words with a sense of caution, because they point to a form of communication, which is limiting in its own right. The ‘cure’ in a lower division environment (one is recovered or getting ‘better’) might – in the end – not provide the final answer as far as the object of health is concerned. ‘Curing’ in a quadralectic environment does not primarily aim at ‘improvement’, but is interested in the ‘understanding’ of the changes, which take place. There is a great difference between the notion of a sickness in a dualistic or in a quadralectic environment. The architecture of a hospital is embedded in this field of tension and should make a statement in this matter. ‘Illness’ should be understood in modern treatment as a process in which a changing point of view is experienced. This change is often regarded as an unwelcome interruption in the relative well-being of everyday life, but should be faced in a wider conceptual setting. Any cure, in a hospital or otherwise, should aim at a clarification of the position of the patient within a dynamic communication. The realm of higher division thinking does not attach any particular importance to a ‘balance’. This sign of opposition does not hold the key for recovery. It should be understood that life, as it manifest itself in the identity of an individual, is a certain phase in a universal communication. The ‘cure’ of any illness starts with a redefinition of the division environment. The hospital is a public place. The Greek Asklepieion was a stoa (business arcade) put to nursing use about 430 BC. The name was derived from the mythological god Asclepios, mentioned by Homer around 700 BC in his ‘Illiad’, and associated with a subterranean spirit in caves, snakes and the provision of water from underground springs. The buildings on the south slopes of the Acropolis in Athens included the foundations of the temple of Asclepios and the two-storied Doric stoa, which was used as the ‘katagogion’ (a hostel for visitors). The buildings were erected after 420 BC. Another example is the Katagogion in the ancient city of Plataea (Boetia), situated on the north-eastern side of Heraion (temple of Hera) and built by the Thebans in 426 BC. It had a rectangular shape with an inner court. The classical hotel (katagogion) was used as a blue print for the building of hospitals. 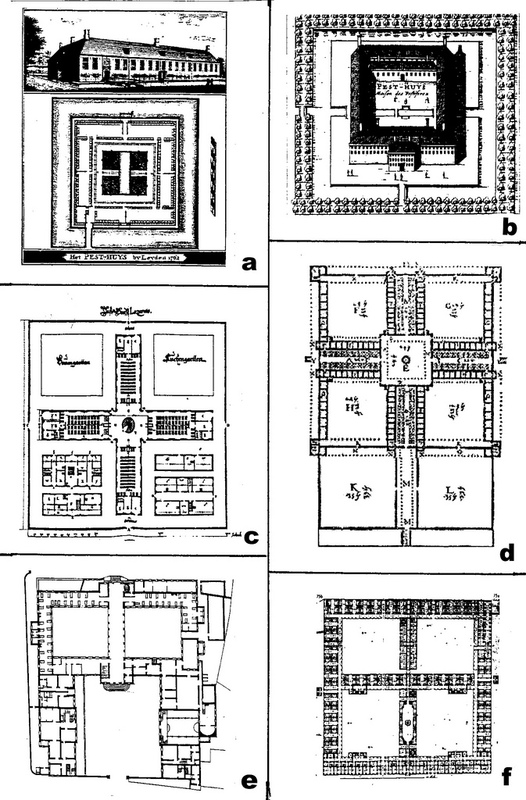 The katagogion in Epidauros, erected in the fourth century BC, was a healing center with a rectangular ground plan, consisting of four courtyards surrounded by colonnades (fig. 332). Fig. 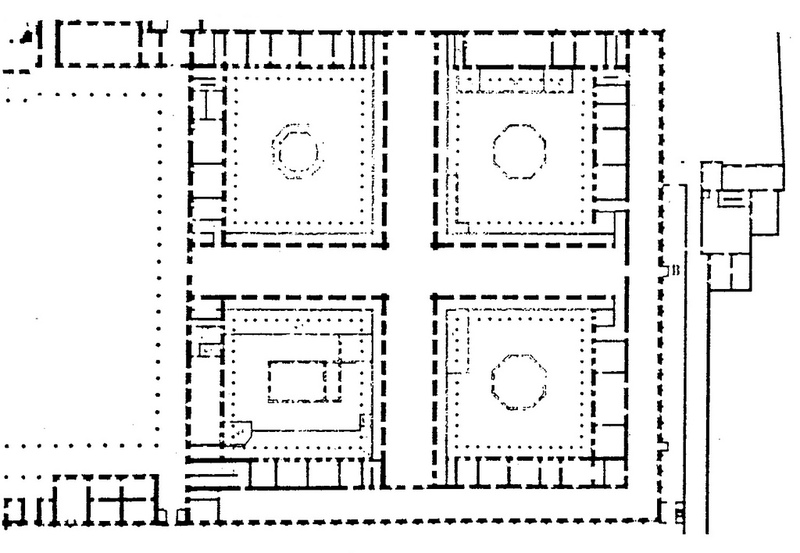 332 – Left: A plan of the Hotel (katagogion) in Epidauros. The guest-house was built in the fourth century BC. 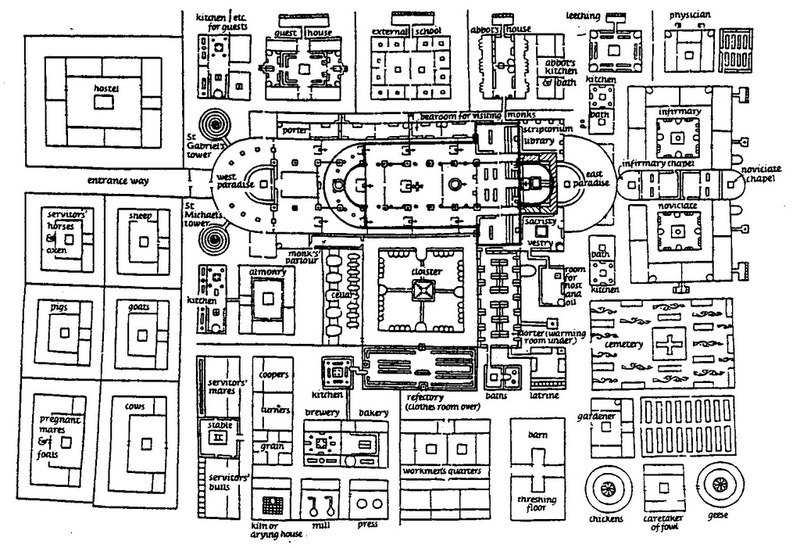 The buildings were two-storied, with twenty rooms in each quadrant giving a total of 4 x 20 x 2 = 160 rooms. Right: The temple of Asclepios in Troizen, near Epidauros, con-structed around 400 BC. To the right is the so-called three-pillar hall, dividing the area in four parts. The covered building was probably used as an inn. The Asclepieion (health resort) on the Greek isle of Cos dated from around the fourth century BC. The German classical philologist and archeologist Rudolf Herzog (1869 – 1943) did archeological fieldwork and excavations on the island between 1898 and 1907. He uncovered, in the autumn of 1902, a sanctuary, dedicated to the god Asclepios (HERZOG, 1932). The complex consisted of three terraces, with the Doric temple of Asclepios on the highest terrace. The research on the sculptures of Cos was continued by Margarete Bieber (1879 – 1978). This remarkable woman became the second female professor in Germany in 1927. Her biography covers a lifespan of nearly hundred years and includes a distinguished scientific career in archeology at universities in Germany (Giessen), England (Oxford) and the United States (Barnard College and Columbia University) (BONFANTE & RECKE, 2004). The island of Cos has a long history of curing and the treatment of the sick. Epigraphical evidence showed that from 600 BC onwards doctors were not only a trade, but also a family group, the Asclepiads (SHERWIN-WHITE, 1973/1978). This restrictive group was maintained until the time of the great Greek physician Hippocrates (c. 460 – c. 370 BC), who was born on the island and taught outsiders for money. The cult of Asclepios, as practiced in Cos and various other health centers in Greece, aimed at a combination of religion and a system of therapeutics and curative powers. A close relationship between the cult of Heracles and Asclepios on the Peleponnesos was mentioned in the ‘Periegesis Hellados’ (Description of Greece; a travel handbook written in the mid-second century AD) by the Greek historian Pausanias (SALOWEY, 1995). The Hippocratic principles, on the other hand, were opposed to magic and ritual, and tried to separate medicine from superstition and speculation. Hippocrates’ scientific framework was based on a four-division (humors) and his medical theories can be seen as the practical application of Empedocles’ philosophical theory of the four elements. No sanctuary of Asclepios exists in Rome, but it is known that the practice of healing along Hippocratic lines entered the city after 291 BC. Votive terra cottas, with parts of the human body in all sizes, were presented to the healing centers are still abundant. The Museo Gregoriano Etrusco in Caere (Cerveteri, Etruria), founded in 1837 during the pontificate of Gregorio XVI, has some fine examples on exhibition (Sala IV). About hundred sanctuaries are known in Italy, mainly in the western and central part (although not all were dedicated to Asclepios). Ekrem AKURGAL (1970) described the Asklepieia of Pergamon, a complex of worship and healing dating from Hellenistic times (second century AD). It is an architectonic interesting site with extensive bathing facilities for patients, a sacred enclosure with a small replica of the Pantheon, a room for the emperor to be used as a library. The half-circle stadium and a circular two-story treatment hall were situated outside the enclosure (fig. 333). Fig. 333 – The sanctuary of Asclepios Soter at Pergamon, was built in the later years of the reign of Hadrian (130 – 140 AD). The ruins of a temple of Asclepios were also found on the other end of the Mediterranean, in the ancient town of Emporion (‘market’), now known as Ampurias (Catalonia, Spain), thirty-five kilometers northwest of Gerona on the Costa Brava. This settlement has a long history. It started with Greek settlers from Marseilles, who founded the Old town (Palaiopolis) around 520 BC. on an island just off the coast (according to the geographer Strabo of Amasia). Archaeological evidence suggests that the settlement might even be older (600 BC). A New town (Neapolis) was established on the mainland after 500 BC. A temple dedicated to the Egyptian god Serapis was situated on a hilltop. The Roman general Porcius Cato built a military settlement to the west of the New town after 195 BC. It was called Emporiae, and the layout followed the familiar rectangular lines of such settlements (like the city of Cáceres in the Extremadura). The Roman valetudinarium, or military hospital, was a regular barrack adapted for the sick and wounded soldiers. The barracks at Vindonissa (Windisch, Switzerland), dating from the first century AD, are a good example. The Vindonissa Museum in Brugg gives a well-documented overview of the Roman settlement. The 13th Legion (Legio XIII Gemina) was stationed here until 44/45 AD and then replaced by the 21st Legion (Legio XXI Rapax), coming from Castra Vetera (Xanten). Building in stone replaced the wooden structures and therefore, the layout of the different architectonic structures are still visible. The water supply of the settlement is partly in use today. The 21st legion was replaced in the hectic ‘Year of the Four Emperors’ (69 AD) by the 11th Legion (Legio XI Claudia). The latter stayed in Vindonissa until 101 AD; when they were sent to the Danube region for further fighting. The building of hospitals emerged on a larger scale from the fourth century AD onwards, starting on the eastern side of the Mediterranean. The inspiration, in contrast to the utilitarian valetudinarium, was found in a new sense of humanity, as proclaimed by the young Catholic Church. The first Christian hospital was described by Basil the Great (ca 330 – 379), bishop of Caesarea and one of the Cappadocian Fathers. He founded between 369 and 374 the Ptôcheion in Caesarea (ptô = poor and cheion means place), which became a model for the xenodocheion (xenos = stranger), establishments for the travelers, pilgrims and poor, associated with the monasteries. A rich Christian lady in Rome called Fabiola decided, around 400 AD, to build a nosocomium, to cater for the sick and feed the poor. The Roman senator Pammachius established a similar foundation (xenodocheion) in Porto (near Rome) after his wife Paulina died in childbirth in 397 (fig. 334). This building and its specific function as a place of charity was probably the first of its sort in Western Europe. The famous Roman general Belisarius founded during the pontificate of Pope Vigilius (537 – 555) a xenodochium in the Via Lata (‘Broad Street’) in Rome. Bishop Mausona constructed a xenodochium in Augusta Emerita (Merida), in the sixth century. Merida is an archaeological important city in the middle of the Extremadura region of Spain. The Roman Via de la Plata, which cuts from north to south through the region, is named after its Roman counter-part. Paul the Deacon reported that bishop Mausona endowed the hospital in Merida with large funds and provided the personnel. The bishop gave orders to bring any sick man, ‘being slave or free, Christian or Jew’, to the hospital for recovery. 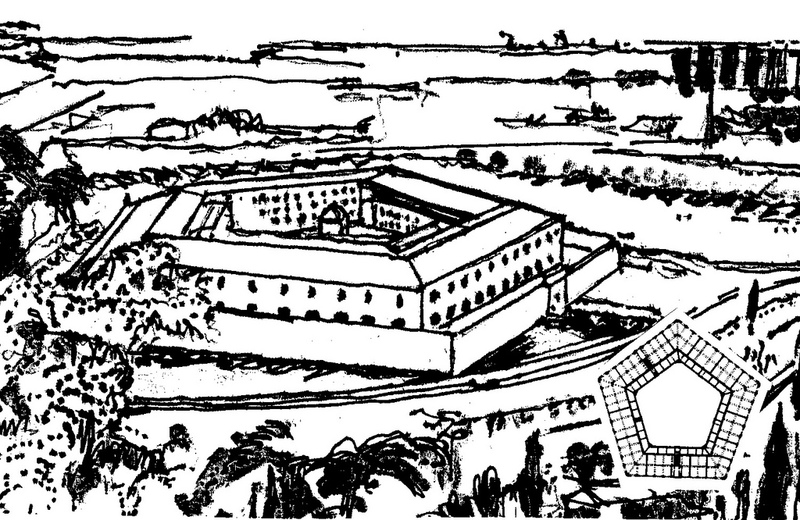 The outlay, as it can be reconstructed today, shows two parallel-elongated buildings perpendicular to the main building. Two intertwining snakes are engraved on one of the pillars, referring to the staff of Aesclepios, the God of Medicine. This symbol of the snakes as evil spirits of the underworld, had been known in the (Middle) East for a long time, and was also mentioned in the creation story of the Bible. The symbolism of the twisted snake(s) was subsequently carried – by the Greek mythology – into the European culture. The heraldic device of the Milan-born humanist Andrea Alciatus (1492 – 1550), an influential writer of the Emblematum liber (Book of Emblems, 1531), was ‘Virtuti fortuna comes’, depicted by a pair of intertwined snakes, pointing to the unification of the opposites (LEEMAN, 1984). Fig. 334 – The Xeodochium of Pammachius in Porto (in the vicinity of Rome) was a place to provide shelter for travelers and care for the needed. This building, geared towards charity, can be seen as a forerunner of the modern hospital. THOMPSON & GOLDIN (1975) wrote an informative book on the social and architectural history of the hospital and the development of hospital ward design. The hospital was often part of a cloister complex, like St. Hugh’s infirmary in the Benedictine cloister of Cluny (around 1050 AD). There is, in fact, a certain parallel between the rapid development of monasticism from the tenth century onwards (Cluny was founded c. 909 by William of Aquitane) and the building of places to care for the needy. The latter included normal guests (in the hospitium), pilgrims, travelers, the (elderly) poor and also, but not primary, those who were ill. General care became part of the communal life of the monks and indicated a shift away from their more individualistic lifestyle as hermits, who copied the life of the Egyptian desert fathers. The Benedictine abbey in St. Gallen (Switzerland) was a large complex with a katagogion, being a place to house important guests (fig. 335). The general plan of the abbey, which was originally drawn around 820 AD, is well preserved and has been copied many times. The lay-out of the main church follows a Latin cross, while the cloister – with its link to the Paradise garden – has the familiar square form. The infirmary is situated on the eastern side of the complex, also in a square fashion. Fig. 335 – The plan of the St. Gallen religious complex was drawn around 820 AD. The guesthouse for important visitors was situated at the north east of St Gabriel’s tower, while another hostel was inferred along the entrance way on the western side (the original map has text written on this place). The infirmary was built to the east of the main church. All these buildings had a square plan, aiming at a sense of enclosure. The building of hospitals and guesthouses in Europe became a common feature in the twelfth century and saw an upsurge in the fourteenth century. The reason might have been a steady increase in population during the ‘Renaissance of the Twelfth Century’ (HASKINS, 1927), but also a growing feeling of charity, directed towards those who could not support themselves. The crisis of the middle of the fourteenth century, when the plague decimated a quarter of the population in certain parts of Europe, might have been an additional factor too. This latter event not only left a deep scar in the self-confidence of the authorities (the Church), but also dented the optimism of material progress. The massive impact on society of a deadly disease can be interpreted – in quadralectic-psychological terms – as the First Visibility Crisis (FVC). This crisis, which is a universal phenomenon in any communication, occurs at the first ‘peak’ (CF = 13) in the Third Quadrant of the CF-graph (the year 1350 in the European cultural history, see fig. 267). The Egyptians experienced – in their cultural history with a visible visibility period (X) from 3100 – 500 BC – the First Intermediate period (2134 – 2040) as their predicament. A social revolution ended five centuries of progress during the Old Kingdom (2686 – 2134 BC; see also fig. 58). The young-mature European cultural entity had the fabric of its society threatened in a similar way by the plague, which rampaged through the emerging cities of Europe in the second half of the fourteenth century. The medieval (cloister) hospitals were mostly built as elongated rooms. The Hospital of St. John the Baptist in Bath (England), which was founded around 1180, is a good example. Another nice specimen is the barrel-vaulted hospital in Tonnerre (Yonne, France) dated from the thirteenth century. The Hospital de la Santa Creu (in Barcelona, 1401) has been transferred by the architect Lluis Domenech i Montaner (1850 – 1923) into a Modern Catalan-style hospital. The Hospice de Beaune (Hôtel-Dieu) (France) is the most beautiful hospital of the middle of the fifteenth century and the building is in perfect condition. The roof, with its geometric patterning, is a tribute to the four-fold. The hospital and church in Cues (Germany) were founded in 1447. The building started in 1451 and was finished in 1457. The consecration took place in 1465 (fig. 336). Fig. 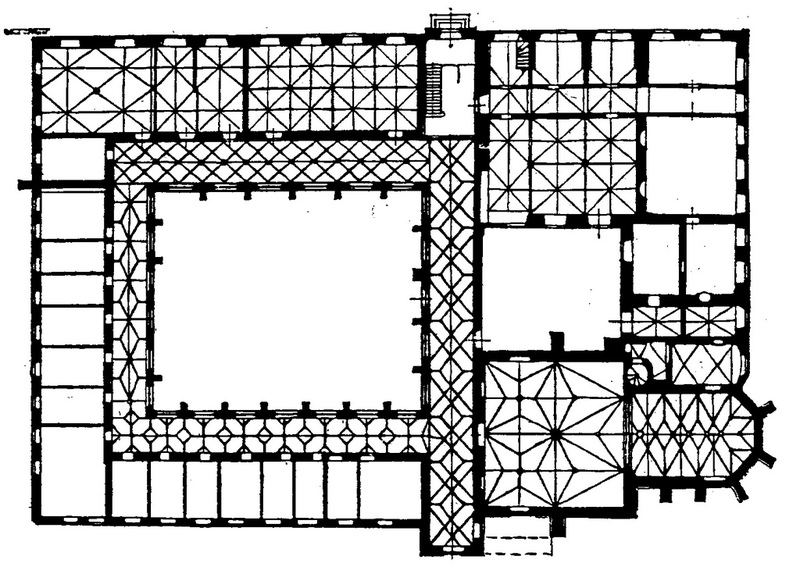 336 – The ground plan of the church and hospital in Cues (Germany) reveals a tetradic spirit, in which a sense of enclosure is dominant. The building of the complex started in 1451. Dieter JETTER (1986) produced maps from various areas in Europe with the locations of the hospitals, which were built in the years of growing visibility of the European cultural period. His list of hospitals is extensive, but not exhaustive. For instance, the perfectly preserved Browne’s hospital in Stamford (England), dating from 1475, is not mentioned. The Hospital of Santa Maria Nuova in Florence is probably one of the first hospitals in Italy to be built in a cross fashion. The building, however, got its cross-form rather by chance. The hall and altar of the woman’s hospital dated from 1315. The additions in 1334 and finally more additions in 1479 resulted eventually in a cross-form in the plan (but with the church at the end and not at the crossing). Fig. 337 – The Hospital Real in Granada (Spain) was designed by the architect Enrique Egas and built between 1511 and 1522. The cruciform layout with four enclosed areas and a central tower can be rated as the ultimate tetradic design. The plan of the Hospital Real de Dementes in Granada (Spain), was built in 1504 by the architect Enrique Egas. It had a (Greek) cross design (fig. 337). The Hospital de los Reyes in Santiago de Compostela (Spain) was another early example, constructed in the period between 1501 and 1511, also by Egas (fig. 338 left). The Hospital de la Sangre in Seville, by the architect Gainza, was somewhat later (1546 – 1600) (fig. 338 right). Fig. 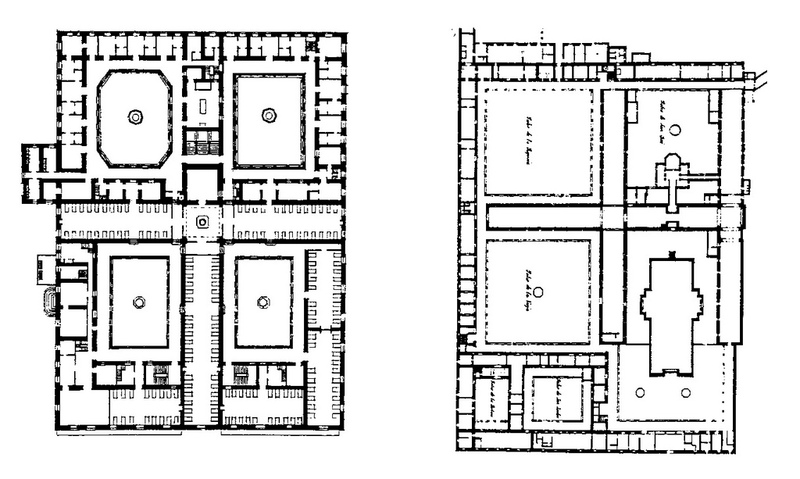 338 – A plan of the Hospital de los Reyes in Santiago di Compostela (1501 – 1511) (left) and the Hospital de la Sangre in Seville (1546 – 1600) (right) have the Greek cross as their ground plan in common. They followed religious-political reasons. Vague notions of the Temple of Salomon might have been an inspiration in the style of hospital building. The visionary description of the temple during the Babylonian exile by Ezekiel provided the historic material, which was briefly described in Chapter 3.2.6 (p. 205) of this book. Salomon prescribed the temple as an exceptional building, and the Spanish Reyes Catolicos had to recreate that impression: rocks were brought from Portugal to Santiago and architects and builders were hired from the Low Countries. The message to the people was clear: architecture was used as a religious motivated expression of power. Dieter JETTER (1987) gave a detailed overview of the hospitals of Santiago, Toledo and Granada and added a great number of other examples of hospitals built in the form of a cross. The three Spanish hospitals were constructed in a relative short time span of nearly twenty years (1500 – 1520). Their intentions can be placed, in Jetter’s view, within the context of a struggle between Christianity, on the one hand, and the Islam and Judaism, on the other hand. The shape of the (Greek) cross is used as a distinct sign for infidels and acted as a Siegesdenkmal (triumphal monument) to thank God for the assistance in the struggle. The cross-shaped hospitals were proof of how to behave in life and how to be prepared for death, as indicated by the king of Spain. King Salomon was the historic example for the Spanish kings and a parallel between Fernando and Salomon was gladly accepted. Salomon was the King of all Israel in the same catholic meaning applied to Fernando, who was the King over all the Spanish properties in the world. The notion of the four-fold became eminent in the end of the fifteenth century and is associated with growing oppositional thinking. The latter manifested itself in a search for boundaries in every field. Many discoveries were made, because a line of thinking was pushed to its limits (within the context of a dualistic framework). The year 1500 can be engraved in the book of (European) history as the Pivotal Point: oppositional thinking reached a creative presence. The world was round from that point in time onwards and would never be the same again. Europe experienced the ‘midlife crisis’ of its cultural existence: it was still strong, ready to conquer the world, but the seeds of incertitude were sown. Fig. 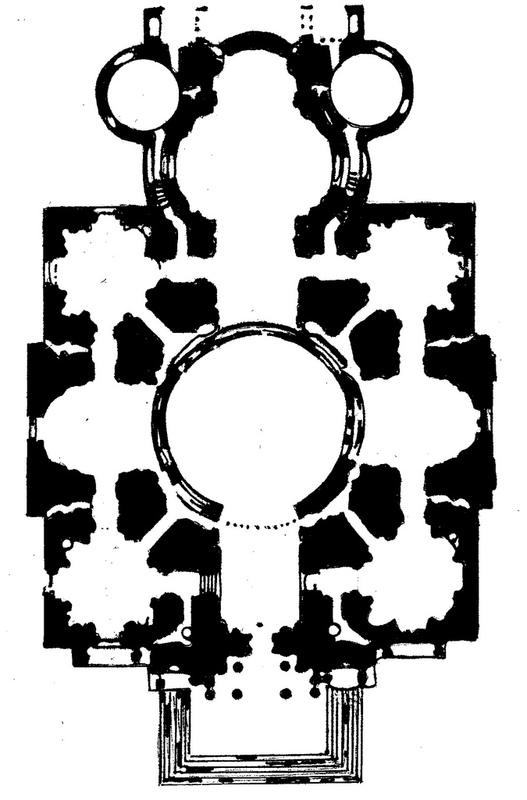 339 – A plan of the Ospedale Maggiore in Milan (Italy), based on an original design by Filarete (1456), displays the basic geometric elements of a square divided by a cross. The Ospedale Maggiore of Milan was one of the first hospitals to employ the cross plan as a deliberate architectonic feature. The Italian architect Antonio Averlino, also known as Filarete (1400 – 1465? ), of Sforzinda fame, gave a detailed description and plan of the hospital as early as 1456. 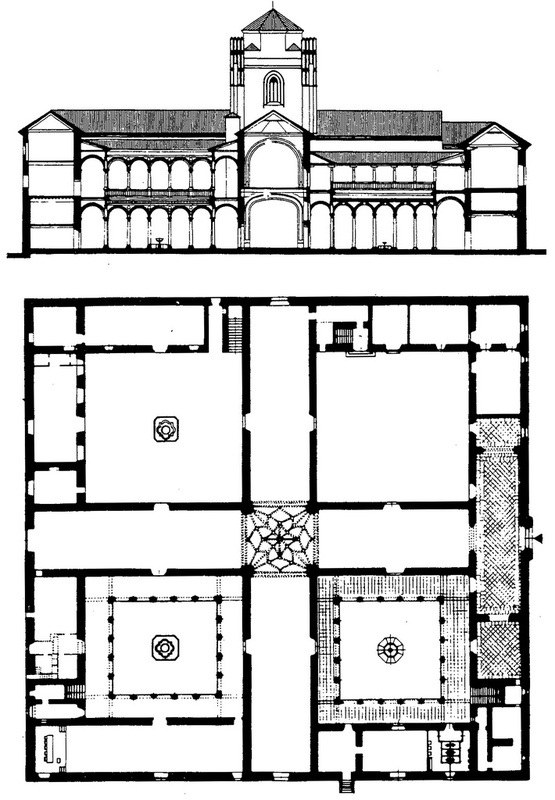 Originally, the cross-shaped plan had a chapel in the middle, but some of Filarete’s design elements got lost in the subsequent execution of the Ospedale Maggiore in the period between 1456 and 1500 (fig. 339). It took, in the end some three hundred and fifty years to complete the project. Subsequently, the building was heavily bombed in 1943 in World War II, but it recovered and is still in use as a hospital today. The outlines of the Milanese hospital, published in his Trattato d’architettura (Tractate on Architecture), written in 1461-64, became an influential hospital design in the years to come. Filarete’s architectonic sketches also occurred in the Codex Maglia-bechiano, an account of the life of the Indians, prepared for the learned Dr. Cervantes de Salazar about 1553. The original book is in the Biblioteca Nazionale Centrale of Florence (Firenze), but a facsimile edition is available (from the publisher Adeva of Vienna, Austria). The Spedale e Chiesa di S. Spirito in Sassia in Rome is a design derived from a truncated (Greek) cross (with one arm missing). The name comes from the adjoining church founded by King Ina for the Saxon pilgrims (Sassia = Sassonia = Saxony). The hospital was founded by Innocentius III, but was thoroughly rebuilt by Baccio Pontelli under Sixtus IV from 1473 – 1477. Many other popes enlarged and enriched the building (fig. 340) and it still serves as a hospital. Fig. 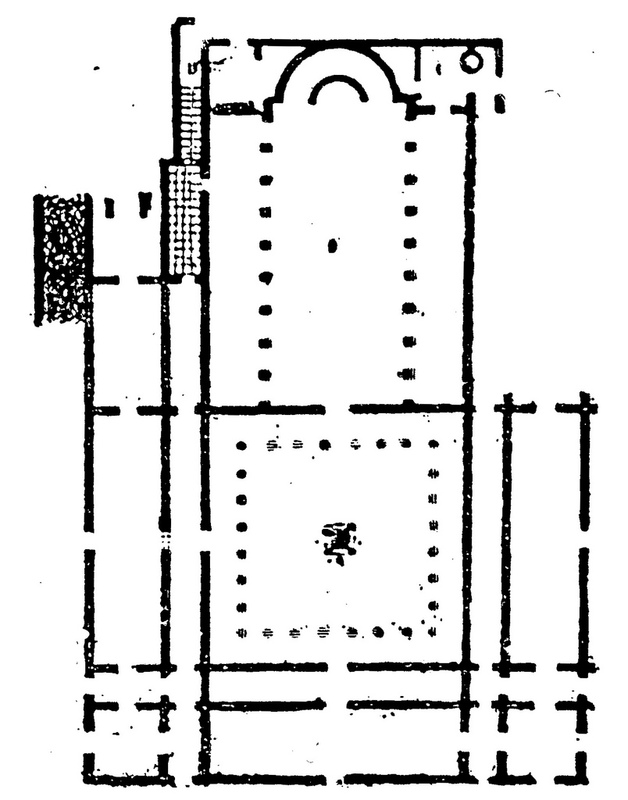 340 – A plan of the hospital (central part) and church (to the right) of the Arcispedale di Santo Spirito in Rome. The hospital part consisted of a truncated Greek cross. The architect was Baccio Pontelli and building took place between 1473 and 1477. The cross-shape plan, as it was pioneered around 1500, became a common outlay of hospitals and asylums in the years to come. The Albergo dei Poveri in Genova (Italy) was built some hundred and fifty years later (1654), and showed the classical cross-in-square (fig. 341). The idea lingered on – and became even more popular – towards the end of the eighteenth century. The project of a naval hospital in El Ferrol (Galicia, Spain), by the architect Josef Müller (1789) is a good point in case (fig. 342). Various plans of institutions of care in Europe are given in fig. 343. They illustrate the attractions of the square and the cross-in-square layout as an important feature in the building of hospitals over a long period of time. There seems to be a historic relation between the intention of ‘healing the masses’ and a tetradic-architectonic setting, even if the eclectic nature of this presentation is taken into account. Fig. 341 – Albergo dei Poveri at Genova (Italy), started in 1654. Fig. 342 – The Hospital Naval in El Ferrol (Galicia, Spain), 1789. Fig. 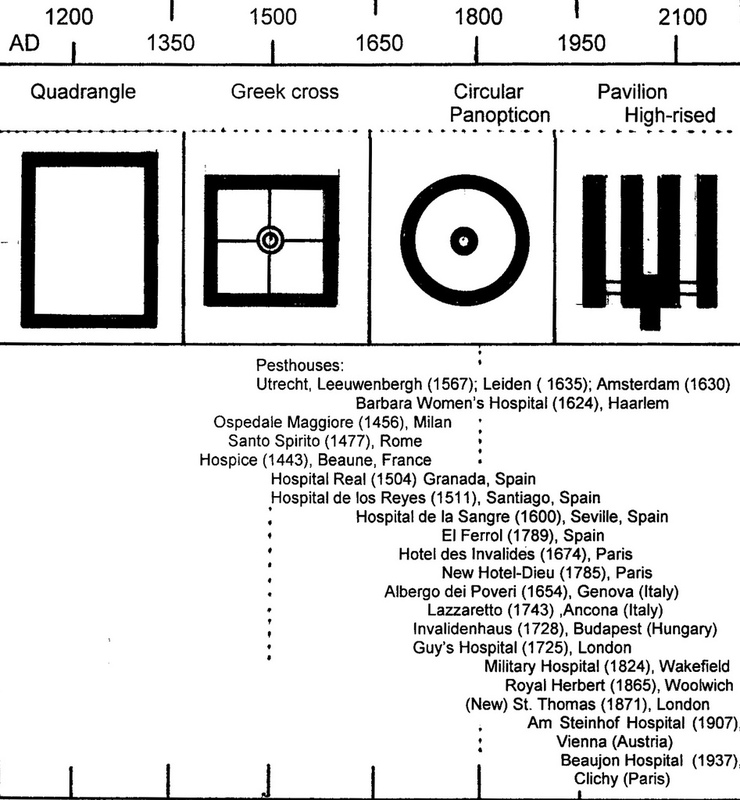 343 – The ground plan of various centers of care in Europe was inspired by the advantages of a square design. The cross-in-square created an enclosure, which facilitated easy supervision and care. A. The Pest-Huys of Leiden (Holland) was started in 1635 and completed between 1658 – 1662; B. The Pesthuis (later Buiten Gast-Huys) in Amsterdam, 1630; C. Furttenbach’s Grosses Lazarett, 1635; D. Project for a hospital by Philibert Delorme, 1626; E. Guy’s Hospital in London, 1722 – 1725 by the architect George Dance; F. Kaiserliches Invalidenhaus in Budapest (Hungary), 1716 – 1728, by the architect Antonio Martinelli. The Dome des Invalides in Paris stands out as a monumental building related to the history of hospital design. The original Hôtel des Invalides was initiated by King Louis XIV (1638 – 1715) to cater for his invalid soldiers. The large complex started as a design contest in the years 1671 to 1674, which resulted in the choice of Libéral Bruant as the winning architect. The hospital consisted of seventeen buildings and was enclosed by a moat. It could house up to four thousand patients. Bruant added a soldier’s church to the southern side of the hospital, which followed the classical three-division of the nave and a ceiling with nine vaults. Fig. 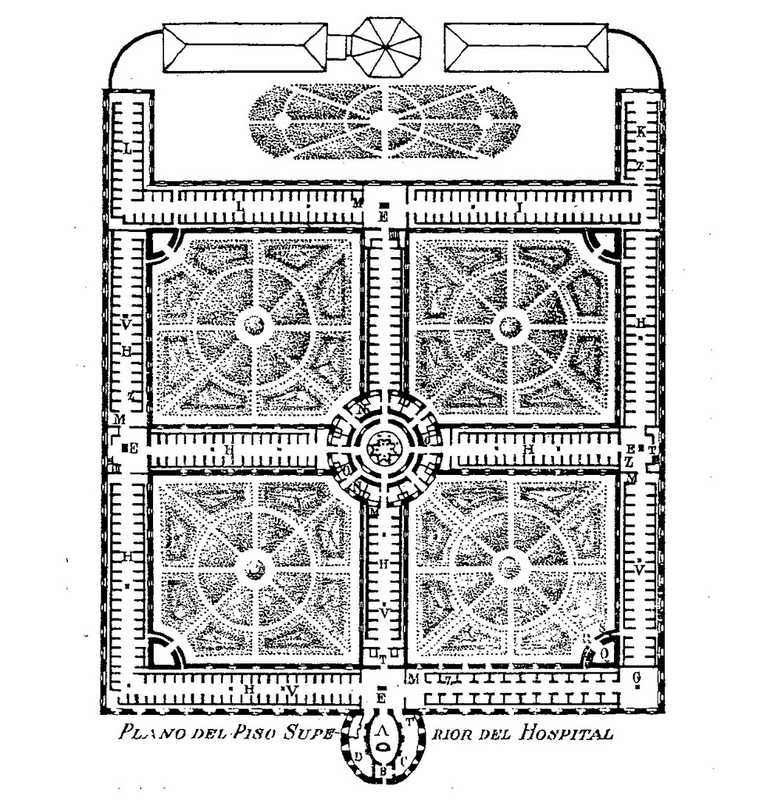 344 – The plan of the Church of the Invalides consists of a Greek cross with four corner chapels. This church, which was initially an addition to a hospital (Hôtel des Invalides) later became a mausoleum, when the body of Napoleon returned in 1840 to this destination in Paris. The building of the church started under Bruant’s direction in the year 1677, but Jules Hardouin-Mansart soon replaced him. The latter architect added an oval choir to the church. A further addition was foreseen to be a mausoleum for the Sun king Louis XIV and later became known as the impressive Dome des Invalides. 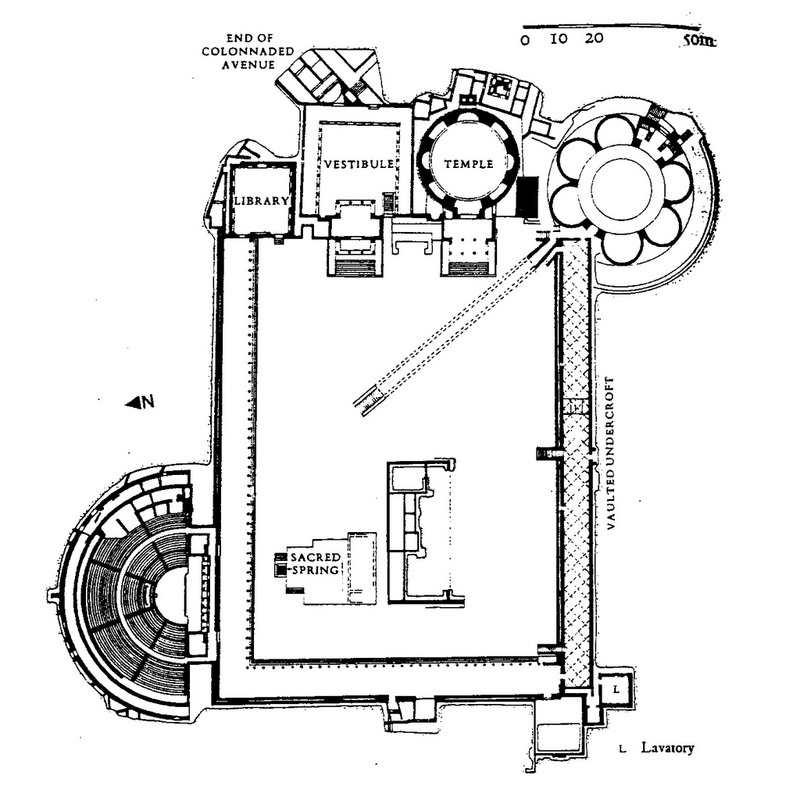 The ground plan of the dome (rotunda) consists of a Greek cross within a square (fig. 344). The design was, according to JANSON (1962/1986) in his standard work ‘History of Art’ (p. 553), ultimately based on Michelangelo’s plan for the St. Peter’s. However, the original idea of the equal Greek cross (by Bernini) was ‘broken’ by the time of Michelangelo’s involvement (see also fig. 215 – 216). The Church of the Invalides was roughly finished in 1690 and its consecrations took place in 1706. The equivocal relation between a hospital, a church and a mausoleum is closely knitted in the history of the Dome des Invalides. It offers sufficient study material in a search for psychological and intellectual motivation behind the buildings. The ‘swing’ from the gallery-type of a soldier’s church (of Bruant) to the oval addition (by Hardouin-Mansart) and finally to the Greek cross with dome (cupola) is, in essence, a journey through various forms of division thinking in the seventeenth and eighteenth-century political landscape of France. Caring for the wounded – Louis XIV’s mainspring to start a hospital – is a social activity, which fits in the realm of higher division thinking. The act of caring is the result of some human concern, aiming at a togetherness, regardless of boundaries. The addition of a church to a hospital tries to extend these communal feelings into the realm of religion. Soldiers and war, and above all, Louis XIVth lust for power is, on the other hand, a strong reminder to the world of lower division thinking. The creation of distance (between people) and the importance of boundaries (both geographical and abstract) are necessary to generate and define a personal identity. The building of a mausoleum, with the intention of self-glorification, can be seen as an effort to carry a human presence over the boundaries of its visible visibility. The mortal remains of the Sun King, after he died in 1715, did not make it to the Dome des Invalides. He is now only represented in the building by a statue on horseback (by Guillaume Coustou). A more illustrious French ruler took his place in 1840. The body of Napoleon Bonaparte (1769 – 1821) was brought back in that year from the isle of St. Helena to be buried underneath the Dome des Invalides. A possible explanation of the changing intentions – from a hospital to a mausoleum – can be found in the context of the European cultural history-as-a-whole (fig. 345). The position on the CF-graph of the latter could elucidate the tribulations of the Dome des Invalides in terms of its psychological setting in time. The reign of Louis XIV covered the second half of the seventeenth century and the beginning of the eighteenth century. His rule can be positioned in the fourth part of the Third Quadrant (III, 4) of the European cultural history (see also fig. 267). The second half of the Third Quadrant (1500 – 1800) was – as a whole – a time of political instability in Europe. It was also the time in which social identities of many countries were established. Around the year 1650 most territories in Europe were in turmoil. This year also proved to be a turning point in the history of Europe, identified as the Second Visibility Crisis (SVC). From this point onwards some ‘Fourth Quadrant’ influences became more influential. Tolerance, for instance, between nations and people could strive forward. The ideas of John Locke (1632 – 1704), in his ‘Epistula de Tolerantia’ (1689) and Pierre Bayle (1647 – 1706) provided an answer to the dead-end street of (religious) opposition thinking. New insights in science spread rapidly and learned societies were established all over Europe. The findings of technology gradually entered the lives and minds of the people. The progress to incorporate the visible (practical) into the invisible (theoretical) alluded to the approach of a wider frame of mind. Fig. 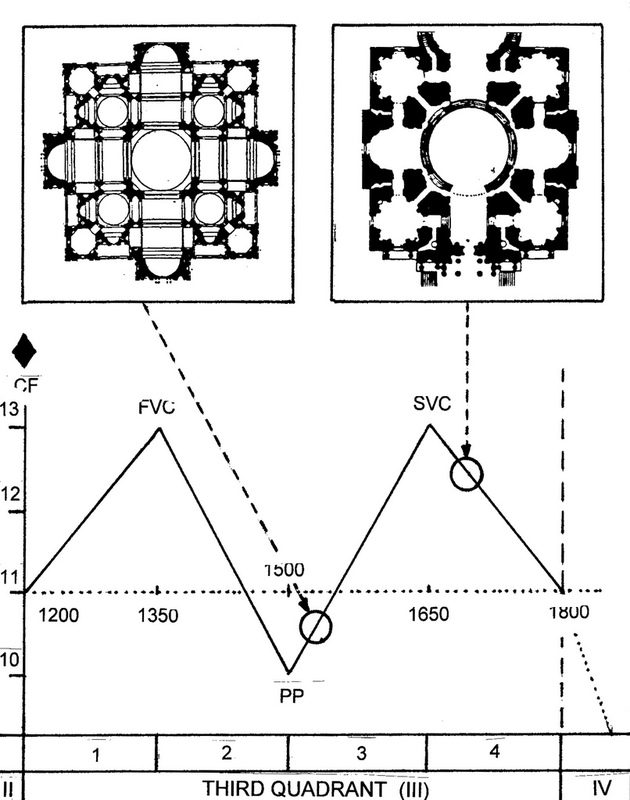 345 – The initiation of the ground plan of St. Peter in Rome and the Dome des Invalides in Paris, as plotted on the CF-graph of the European cultural history. Their position is in the first quarter of the third (III, 3) and fourth part (III, 4) of the Third Quadrant. Bernini’s use of the Greek cross (left) was intended to be a sign of sublime perfection (which was ‘broken’ by Michelangelo). 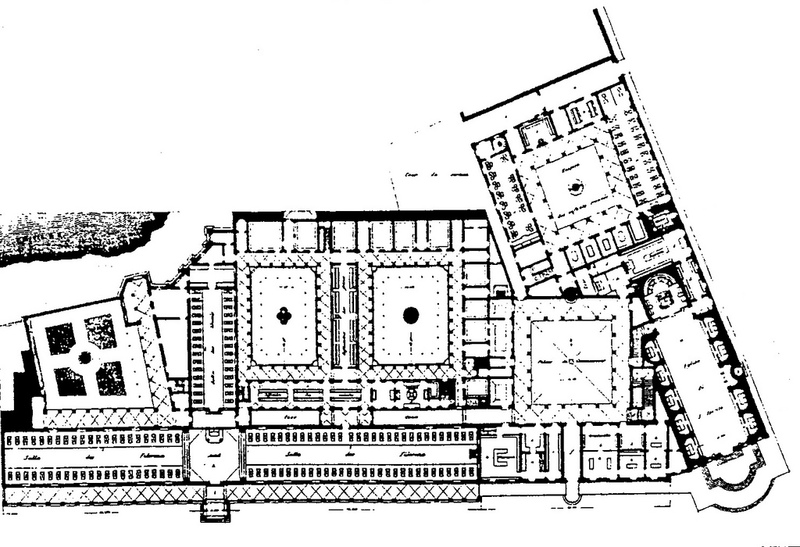 The ground plan of the Dome des Invalides (right) was a retreat from Baroque’s ovals and pointed to the upcoming Neoclassicism. Another peculiar building in the history of hospital architecture is the so-called Lazzaretto (Laemocomium or ‘Mole Vanvitelliana’), built near the harbor of Ancona (Italy). The Lazzaretto project in Ascona was drawn and supervised by the architect Luigi Vanvitelli (1700 – 1773) between 1733 – 1738. 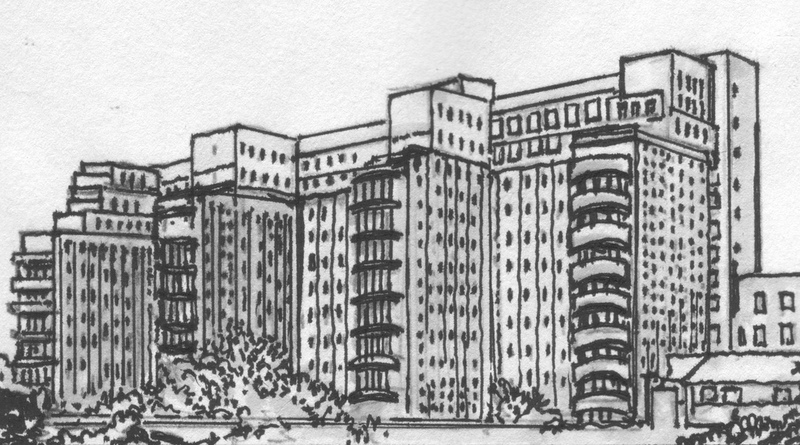 This hospital-fortress should be mentioned here as a specimen of the five-fold (fig. 346). Its pentagonal plan carries a message of higher division thinking, but the plan can also be inspired by numerology and extended oppositional considerations. The same question of intentions holds for the Pentagon in Washington (USA). This office building, primary constructed for the bureaucracy of war, found its inspiration in army fortresses. It was built between 1941 – 1943 by the principal architect G. Edwin Bergstrom (1876 – 1955) and consists of five concentric pentagonal rings connected by perpendicular corridors. Fig. 346 – The Laemocomium or Mole Vanvitelliana near Ancona (Italy) started its existence as a hospital (Lazzaretto), which was built between 1733 – 1743. The pentagonal building covers more than twenty thousand square meters and was intended to protect the military authorities from the risk of contagious diseases. Later it became a military hospital and barrack, and now it is in use for cultural exhibits. The monumental proportions of the Lazzaretto project could be traced back to the father of Luigi Vanvitelli, the Dutch painter Gaspard van Wittel (1652 – 1736). The latter gained popularity in Italy by his view paintings, and can be regarded as the forerunner of the Venetian view painters like Carlevaris, Caneletto, Belotto, Guardi and others. Gaspard van Wittel (or Gaspare Vanvitelli) was familiar with the ‘camera obscura’, an optical instrument which cast an image onto a screen within the box. He used – for his large panoramic ‘View of Piazza Navona’ – the camera obscura to take a series of snapshots, rather than using the complicated network of sight lines to create a linear perspective (MORRIS, 2003). The technological novelties, like the camera obscura, resulted in a different type of painting. Nature and its representation approached each other and architecture followed in due course. The Baroque period in the European cultural history – lasting from circa 1600 to 1760 – derived its name from the extravagant shapes, which were often found in nature itself. ‘Optical illusion is in fact (to Ruskin’s grave displeasure) amongst the most characteristic devices of Baroque architecture’ said PEVSNER (1943/61; p. 184) when he typified the observational mood of this period. The pentagonal Lazzaretto near Ancona was conceived in the final stages of the Baroque period (in 1732) when a reaction against the frivolities of the representation of nature became immanent. Luigi Vanvitelli sympathized with classicist tendencies in art, which gained him the order to redesign the façade of the St John Lateran (in 1732) and the façade of Palazzo Poli behind the Trevi Fountain in Rome. A consolidation of the dome and internal adjustments of St Peter’s basilica in Vatican (1750) further showed his skills. The commission of Charles VII of Naples to be involved in the building of the Palace of Caserta (see also fig. 734/735) can be regarded as the crown on his technical and engineering capabilities. The construction of an aqueduct system to lead water to the fountains of Caserta fits into the sympathy for the element of water as a supporting entity in architecture. Fig. 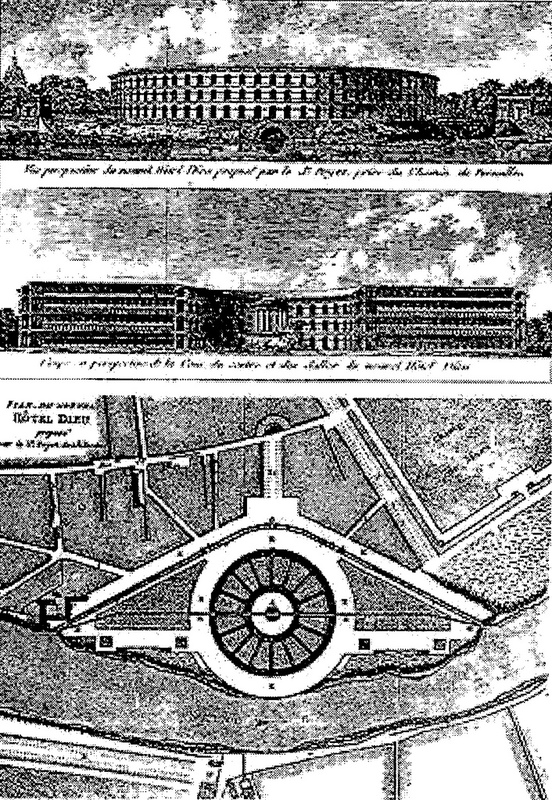 347 – The project for a new Hôtel-Dieu by Antoine Petit in 1774 envisaged a hospital along radial lines. The old Hôtel-Dieu burned down in 1772. The rebuilding (in a different form) was delayed by several decades due to the French Revolution. Hospital design reached a new phase at the end of the eighteenth century with the introduction of a circular building, which had different wards, radiating from a center point. Antoine Petit took the first exploratory steps in 1774. 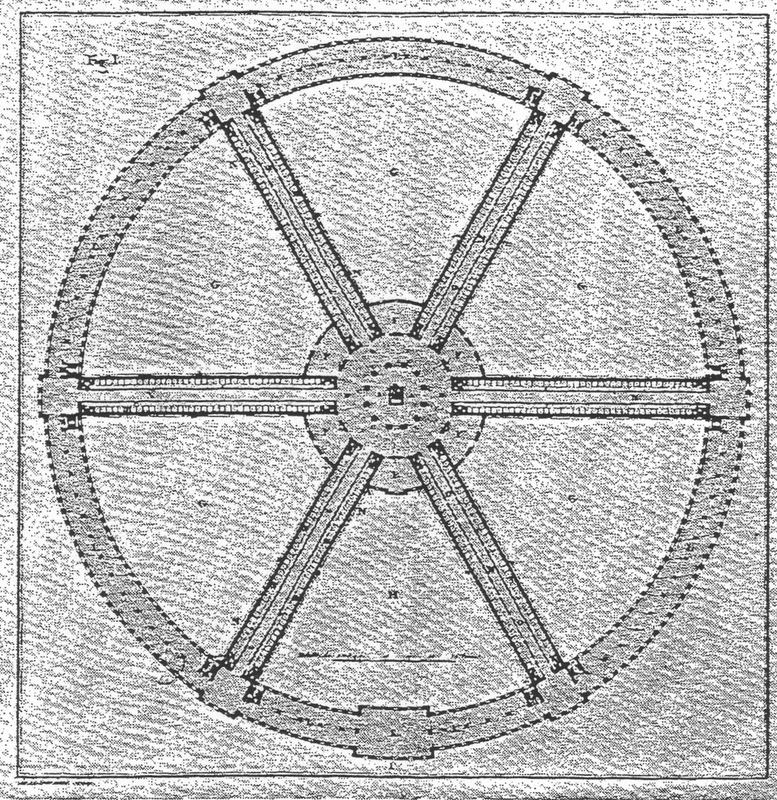 He proposed, in his ‘Mémoire sur la meilleure manière de construire un hôpital de malades’, a circular hospital lay-out with six spokes (fig. 347). 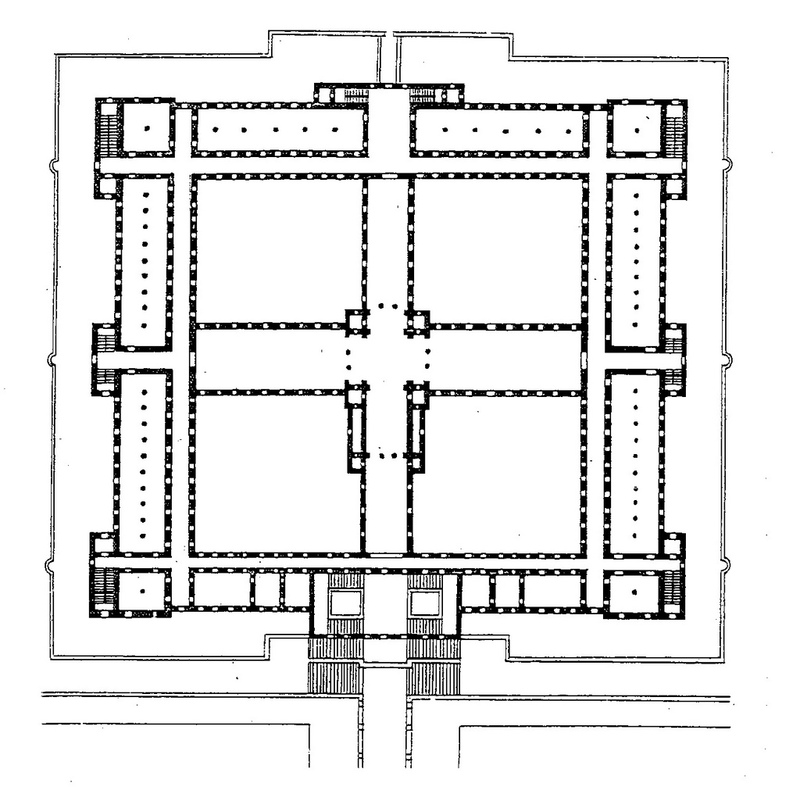 A new generation of French architects at the Académie Royale d’Architecture expressed in their drawings and plans a general tendency towards radial schemes of the ground plan – in much the same way as Spanish architects had embraced the square and cross lay-out a little less than three hundred years earlier. The spirit around the year 1800 was geared towards the division of the multitude. The four-fold played an important, but not exclusive role, in this process. A report by Jacques René Tenon (1724 – 1816) underlined the necessity of creating isolated hospital wings with good ventilation. The dimensions of the hospital wards were, for the first time, calculated on patients’ respiratory needs. The hospital’s function was now solely reserved to treat the ill. 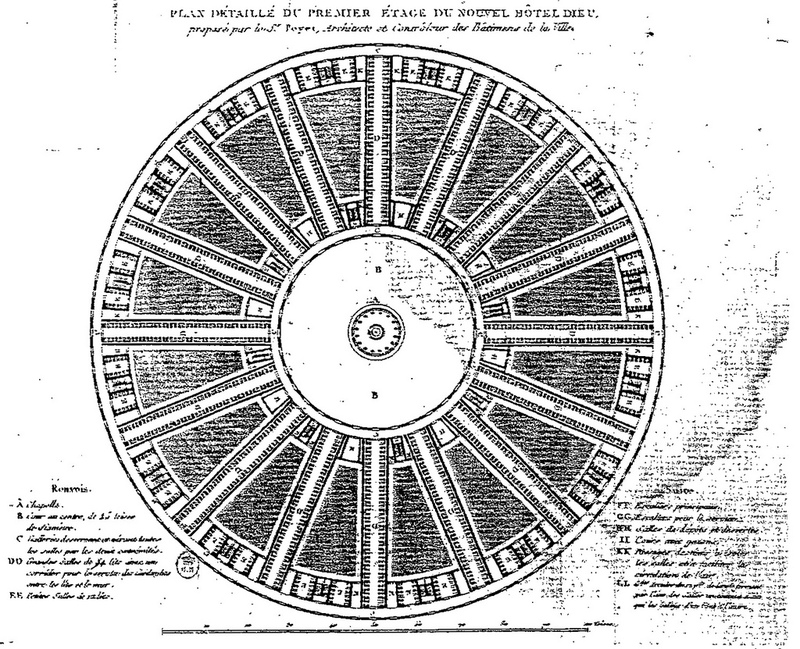 The so-called ‘marguerite’ in the Hôtel-Dieu in Paris followed a radial pattern, with sixteen spokes and was designed by the architect Bernard Poyet in 1785 (fig. 348/349). Fig. 348 – A detailed circular plan of the second floor of the New Hôtel-Dieu in Paris was designed by Bernard Poyet (1742 – 1829) in 1785. The ‘marguerite’ of the hospital, which was planned on the Ile aux Cygnes in the middle of Paris, had sixteen spokes. The old Hôtel-Dieu cared for three to four thousand patients in twenty-five wards and contained a total of just over twelve hundred beds. In times of epidemics the number could easily rise to six or seven thousand. Different patients, be it with a contagious disease or insane, thus used the same bed. The French chemist Antoine Lavoisier (1743 – 1794) – whose name is connected with the Law of Conservation of Mass – noted that ‘on entering the hospital, a patient is often placed in the bed and sheets of a scabies infected corpse’ (Oeuvres, Vol III, p. 636). Lavoisier also reported on the sanitary conditions in prisons (1791), insisting on a clean environment, an adequate supply of water, proper ventilation and hygiene. Fig. 349 – Two side views and a plan of the proposed (new) Hôtel-Dieu in Paris by Bernard Poyet, launched in 1785. The principle of fresh air and separation to ‘rid the hospital environment of the fatal miasmas responsible for disease’ found response in England. 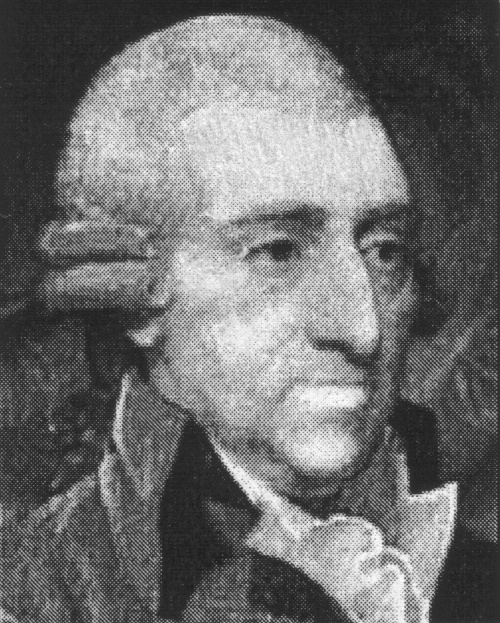 The English reformer John Howard (1726 – 1790, fig. 350) mentioned – in 1784 – the design of the Royal Naval Hospital in Plymouth (1758 – 1762) as the right approach in the building of hospitals. Howard was known, in the latter half of the eighteenth century, as an authority on prison conditions. ‘John Howard has visited all Europe – not to survey the sumptuousness of palaces, or the stateliness of temples; or to make accurate measurements of remains of ancient grandeur, to form a scale of the curiosity of modern art; not to collect medals or collate manuscripts – but to dive into the depths of dungeons and plunge to the infection of hospitals; to survey the mansions of sorrow and pain; to take the gauge and measure of misery, depression and contempt; to remember the forgotten, to attend to the neglected, to visit the forsaken, and compare and collate the miseries of all men in all countries. His plan is original; and it is full of genius as it is of humanity’. Fig. 350 – John Howard (1726 – 1790). John Howard ended his adventurous life in 1790 after contracting typhus in a military hospital at Cherston (Crimea). The insights to improve the well-being of patients by better use of space and ventilation found its reflection in the way hospitals were designed and built. Jeremy Bentham (1748 – 1832), another English social philosopher of that period, advocated a circular building with a central point of observation. He coined the word ‘panopticon’ in 1796 to describe such a radial building. The circular concept was suitable for the construction of institutions like hospitals and prisons (see Ch. 3.6). The times of change, which ran through the various countries of Europe between 1750 – 1850, affected all layers of society and found its common denominator in a redefinition of personal and national identity. This process resulted in France into a genuine social revolution (1789) and in England in the ‘Industrial Revolution’, which covered the above given period as a continuing process of technical improvements. Both high tides of human activity were, for better or for worse, fueled by the desire to reach for a collective historic presence. The Frederik’s Hospital in Copenhagen (now Museum of Decorative Art) was built by the Danish architect Nicolai Eigtved (1701 – 1754) around 1750 – at the very beginning of the new era in Europe. 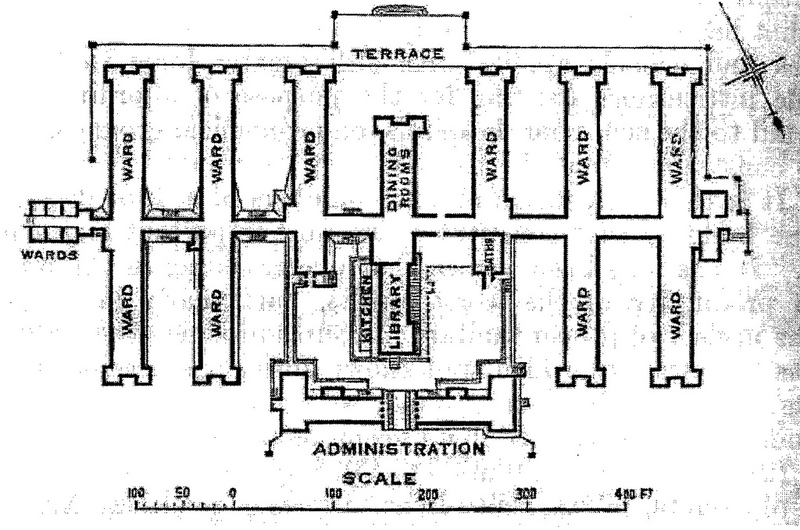 The design of the hospital was based on wards, which were arranged as long galleries (fig. 351). The bed determined the actual size of the wards: 6 x 3 feet. There was to be six feet between beds in both directions. The dimensions were not determined by the distance between columns or golden sections or other beautiful proportions, but simply by the size of the beds. A restoration of the hospital buildings took place by Kaare Klint (1888 – 1954). He made an extensive study of the dimensions of domestic articles as a basis for general architectural proportioning (RASMUSSEN, 1959). He discovered that measurements in meters and centimeters did not give a coherent system in proportioning, but proportions became lucid and simple when measured in feet and inches. This phenomenon pointed to the relation between the type of measurements and its subsequent evaluation in terms of (subjective) beauty. Fig. 351 – The proportions of the rooms in Frederik’s Hospital, Copenhagen (Denmark) were determined by the size of the bed. The nineteenth century was a bristling time of scientific and pseudo-scientific endeavors flared up by the widening of division thinking and a renewed curiosity. The spirit of the time was reflected in hospital architecture and a great variation of building plans can be noticed. The familiar variations on the linear and square plan were joined by circular plans (which did not materialize past the drawing board) and extended cross-plans, like the hospital of Wakefield (fig. 352). Fig. 352 – This model of the hospital in Wakefield (1818) indicated the use of the Spanish-Italian cross-type plan to create space and openness in the hospital design. The English architect Henry Currey (1820 – 1900) took on the change in attitude towards patients in the nineteenth century. He was a prominent Victorian hospital architect, who put forward the ‘pavilion principle’ (COOK, 2002). The new St Thomas Hospital – on the Thames site overlooking the Houses of Parliament in London – was rebuilt between 1868 – 1871. It is the crown of Curry’s architectural work. The St Thomas hospital – with a history going back to the twelfth century – consisted of six pavilions arranged side by side along the riverfront. 4. A lack of sun light. The comb or rack design (pavilions joined a gallery), like the hospital in Nottingham (1824) and the Royal Herbert military hospital in Woolwich (1851) (fig. 353) offered a solution to these problems. The completely detached pavilions – ‘taking the quest for the separation of pathologies and the desire to prevent contagion effects to the extreme’ – found expression in hospitals in Paris like the Broussais (constructed during a cholera epidemic), the Bicêtre Hospital (1883), the Boucicaut Hospital (1887; initiated by Marguerite Guérin, the widow of the owner of the Bon Marché) and the new Salpêtrière (1911). Fig. 353 – The Royal Herbert Hospital in Woolwich (London), was the first building complex to administer to the pavilion type of spatial arrangement. It opened in 1865. Its design by Captain Douglas Galton of the Royal Engineers became a role model for similar hospitals, either military or civilian. Galton was a nephew of Florence Nightingale. The hospital was closed in 1977 and is now converted in flats. Most of the hospitals in the twentieth century followed a modern trend, by applying new materials and up-to-date logistic insights. The results vary, at best, between the pavilion type in open grounds or, more often, as a high-rise building. Their main point in common to the latter is a lack of human scale and a reduction of the curing process to a mechanical effort by chemistry and technology. The Beaujon Hospital of Clichy (Paris), built between 1932 – 1935, is just an example of these factory-like hospitals, which sprung up all over the world (fig. 354). Fig. 354 – The Beaujon Hospital in Clichy, a northern suburb of Paris, was designed by the architect J. Walter in 1929 and built between 1932 – 1935. The thirteen-story high, east-west orientated building is described (on the French website PAPHE), as a ‘composition horizontale de type pavillionnaire et la disposition verticale fonctionelle’, but seems a long distance away of the original intentions of the pavilion-type of hospital. A noteworthy specimen of the developments at the turn of the century is the hospital ‘Am Steinhof’ in Vienna (Austria), now called the Otto Wagner Hospital. The architect Otto Wagner (1841 – 1918) drew the first plans of the complex, early in the century (1902), but clashed with his patrons over the actual style (either neoclassicistic/neogothic or ‘modern’). He regarded the psychiatric hospital as part of a ‘Gesamtkonzept’ (or ‘Total Design’; WIGLEY, 1998). It comprised some sixty pavilions, and included a church, organ, sculptures, stained-glass window, etc. St. Leopold’s Church, situated on top of a hill, is now a stunning example of the emerging Jugendstil, the German/Austrian version of the Art Nouveau. The actual building took place under Franz Berger, between 1904 – 1907. The Leopold Church, clad with Carrara marble and capped with a copper-plated dome, takes – not unlike the Dome des Invalides in Paris – a prominent place within the hospital grounds. The sculpture of four bronze angels was done by Othmar Schimkowitz (1864 – 1947) and adds a distinct tetradic element to the feature. The sinister role of the hospital in the Second World War, with its specialization in child euthanasia, is recorded in a museum. The Hospital e Maternidade S. Luis at São Paulo (Brazil) by the architect-firm Bross, dos Santo, Leitner and Oliveira showed that there is still ample space for well-designed hospitals in modern times. 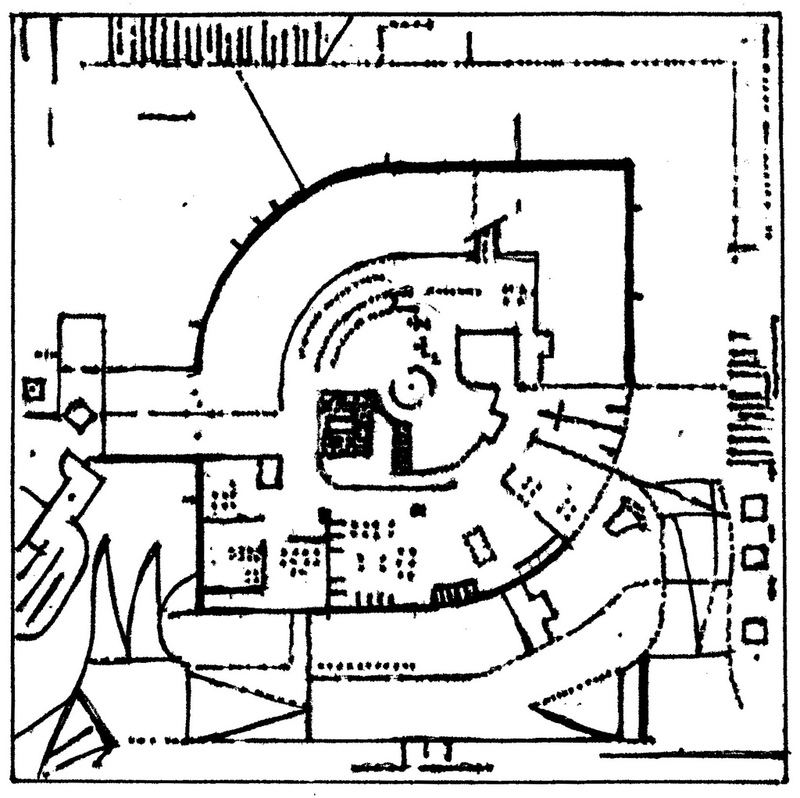 The ground plan of the hospital is drawn in the shape of an eye and constitutes of two extended half-circles (fig. 355). Fig. 355 – The ground plan of the Hospital e Maternidade S. Luis in São Paulo (Brazil) gives a modern interpretation of the panoptical idea. The additional interpretation of the plan as a shape of an eye would bring this building within the realm of quadralectic architecture, aiming at a new type of visibility. A preliminary conclusion of the various building styles of hospitals can now be drawn up. Hospitals provide a well-documented part of the architectural history. Tetradic elements are present in certain stages of its development. This observation will come to no surprise, since illness and curing are a complex phenomenon, which can only be understood in a wider setting. The architecture of hospitals and their layout follows a line, which reflects the ideas of society towards the sick and disabled. The French historian and philosopher Michel FOUCAULT (1926 – 1984) researched the relation between places of confinement and the attitude of the persons involved, both as objects of compassion and as people in power. He described the regimes in prisons, asylums, hospitals, factories and schools in books like ‘The History of Madness in the Classical Age’ (1961), ‘The Birth of the Clinic’ (1963) and ‘Discipline and Punish’ (1975). Foucault painted the picture of a ‘disciplinary’ society, which is based on three primary techniques of control: hierarchical observation, normalizing judgment and examination. Power, control and discipline are essential psychological items, operational in an oppositional environment. Foucault’s subdivision follows, by and large, the components of a quadralectic communication: the observation is characteristic of the Second Quadrant (II), the examination (test) belongs to the Third Quadrant (III) and the normalizing judgment is a Fourth Quadrant (IV) operation. The latter is a type of disciplinary control, concerned with people or groups that fail to reach the required standards (for instance, in education, medical practice or industrial processes). Michel Foucault described a future society like the one predicted by James BURNHAM (1905 – 1987). His visionary book ‘The Managerial Revolution’ (1941) is still a major contribution to the insight in sociological and political processes in the second half of the twentieth century. The strange moves in Burnham’s own intellectual career – from Trotskyism to neo-conservatism (KELLY, 2002) – do not reduce this achievement. George ORWELL (1946), of ‘1984’ fame, wrote an excellent essay on Burnham’s motives. Burnham’s book explained that a class of managers holding control of the means of production – like business executives, technicians, bureaucrats and soldiers – will grip the power in a global political configuration (MYERS, 2001/2009). The adherents to obsolete, pre-Second World War doctrines based on dualities (like the rich and poor in capitalism, the have and the have-not of socialism and the bourgeoisie and proletarian in Marxism) are doomed to lose their influence. This innovative message, and Orwell’s commentary on power worship, is still relevant today. Fig. 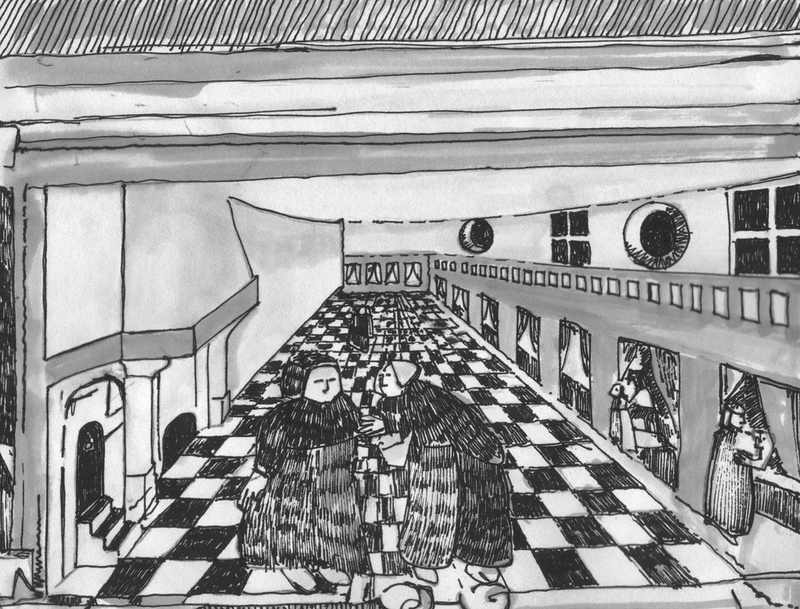 356 – This scene in a women’s hospital (Santa Barbara) in 1624 is depicted on a memorial stone in the Jansstraat 54 in Haarlem (The Netherlands). The medical care was, although technically insufficient, on a human scale. The development in hospital architecture must now come to a close. The building of hospitals has always reflected the ideas of care as visualized by the people in power (fig. 356). The stoa-like arrangements in ancient Greece (Epidaurus) became a model for the Romans. The hall-type of the European Middle Ages started as a simple annex to the church, but eclipsed into architectural statements of religious power. The ground plan of some Spanish hospitals – in the form of a cross – pointed to visions of Paradise and a New Jerusalem. The houses of care of the seventeenth and eighteenth century originated in genuine humanitarian feelings, which was reflected (again) in simple, rectangular buildings. The care of the sick became institutionalized in the nineteenth century and the architects followed in due course. The totalitarian panopticon idea became an option, paying tribute to the unity of the circular. However, also a diversification into fully detached wards in a (rural) pavilion setting was tried. The twentieth century added the factory-like hospitals. Fig. 357 gives, as a preliminary overview, the developments in hospital building in the European cultural history, with a special attention to the form of the ground plan. Fig. 357 – This simplified scheme gives the basic geometric types of the ground plan as applied to hospital architecture in the European cultural period from 1200 to the present. Good research! perhaps you should write a book on this?